Tom and Becky Loftus make award-winning cheese in the hills of Vermont. In December, the Upper Valley Land Trust (UVLT) purchased a conservation easement on the 35 acres that make up Blythedale Farm, Inc. This was made possible through grants from the Vermont Housing and Conservation Board (VHCB) and the U.S. Department of Agricultureâ€™s Farmland Protection program. The agreement had the effect of enabling Blythedale Farm to expand and to continue Vermontâ€™s tradition of artisan cheese-making into the future. Though the farm has been producing gourmet quality cheese for over 10 years, the Loftusâ€™ have owned and operated the business since 2004. They bought the property and cheese-making operation after working on the farm and learning the trade from the previous owner. They hand-ladle all their cheeses and use only whole milk from their 60 Jersey cows. The soft cheeses they make, Brie and Camembert, require a great deal of â€œhands-onâ€ care and are considered the most difficult of cheeses to make. Blythedaleâ€™s award-winning Camembert, Gruyere, and Brie cheeses are highly sought after and are marketed throughout the U.S., even having been served at the White House! With demand for their products steadily increasing, the Loftusâ€™s have been expanding the cheese-making operation since buying the farm. Growing the business was risky without securing additional land. When the Loftusâ€™s took ownership, the farm consisted of only 35 acres and relied upon over 100 acres of rented pasture and hay land to support the dairy herd. 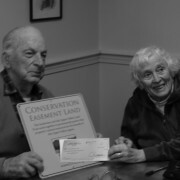 Tom and Becky sold a conservation easement in order to generate capital to purchase the land they need. â€œWe are now able to rest comfortably knowing that we have the land base we need to support our business,â€ says Tom Loftus. 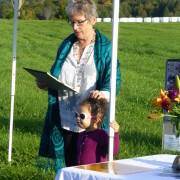 The grants funding the conservation project were made because of the significance of Blythedale Farmâ€™s soil resources and management practices, and its contribution to the Vermont farm economy. Recently, the farm has received the Vermont Quality Milk Award for being in the top 2% of milk producers statewide. This award is granted to Vermont milk producers who practice sound animal husbandry and maintain the cleanliness of their cows, as well as the cleanliness and maintenance of their milking and milk storage equipment. In addition to providing a site for milk and cheese production, the farm consists of a half mile of road frontage, over 75% open farmland with approximately 80% prime and statewide significant agricultural soils, along with native grasses managed without tillage. 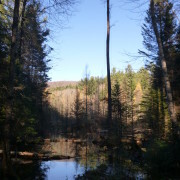 The Castanea Foundation, a private organization working to increase the number of economically viable and environmentally sustainable farms in Vermont and New York, assisted with the acquisition and conservation of additional land known as â€œthe South Branch parcelâ€ which has now been brought into Blythedale Farm ownership. The conservation of Blythedale Farm and the South Branch parcel protects a viable piece of Vermontâ€™s rural character and agricultural industry. The farm sits in the heart of Cookeville village amidst historic buildings including the Town Offices and Academy Building. Recent residential construction in the immediate vicinity of the Blythedale Farm indicated that farmland was potentially at risk for development. Tom Loftus says, â€œWe arrived here because we bought the cheese business and we found OCHP [Orange County Headwaters Project] along with some of our neighbors to be active in land conservation. Conservation is something we believe in and wanted to be a part of.â€ Now, the Loftusâ€™ open pasture forms the scenic backdrop to a â€œclassicâ€ Vermont village and sets the stage for good things to come.